Heather Ostler is the author of The Shapeshifter's Secret - Today she stops by to have a chat with us! Describe your novel in 3 words! Intriguing! Tell us about your inspiration for "The Shapeshifters Secret"
Gosh, so many things inspired this book, however the biggest motivation was my parents. My mom for constantly feeding my library with fantasy novels, and my dad for encouraging me (and taking me seriously!) when I told him I wanted to become a writer at the age of 13. He passed away shortly after that, but I never forgot his optimistic words or his support. Sounds like you have supportive parents! Tell us about your main character Julia! Is she based on anyone? What are her strengths and weaknesses? Julia isn’t based off one person, but parts of her were inspired by others. She is brave, smart, quick, fearless, and sympathetic. However, she is short-tempered, defiant, and often blinded by pride. Julia is also very passionate which is a good thing, but it means that she becomes easily infatuated. A girl of many traits, I like that! How long did it take you to write TSS? It took me a full year to write TSS, and then another six months to edit. But I’ve been writing short stories about Julia since middle school! Did you know what the story was going to be about from the start? Did anything change along the way? I knew what the relationships would be like, and major parts of the plot, but originally I made Julia a fairy. Later on I realized that it was a change for the better when she became a werecat shapeshifter. Wow, that is a massive change! I can imagine the story would have gone a different way! Tell us, any future books in the works? I’m currently just focusing on TSS series, but I have so many other ideas that I’d like to eventually complete. Reading (of course! ), ballet, and eating chocolate. Not sure if that last one really counts! Of course it does ;) Special writing habits? I write best on cloudy days with a heater, and hot chocolate. And I always come up with ideas for characters, dialogue, and plot twists while I’m in the shower. Leave a special message for fans! Thank you so much for your interest in The Shapeshifter’s Secret. I really hope you enjoy it! You can find out more through Heather's various pages! "Julia is finally discovering what–not who–she is. Like any sixteen-year-old, Julia's used to dealing with problems. From her overprotective father to her absent mother to a teacher who definitely has it in for her. But everything changes when Julia's reactions become oddly vicious and angry---more animal than human. This action-packed adventure has it all: humor, romance, and a plot that will keep you guessing to the very last page." 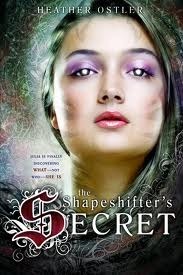 The Shapeshifter's Secret is set for release June 12! Thank you Claire for the interview!